Celebrities are donating their time by signing autographs, posing for pictures, and spending time with fans to help raise money for the hurricane victims and Las Vegas Shooting Victims families. With the devastation caused by the recent hurricanes and the tragedy of the Las Vegas shootings, help is on its way from a group of real life superheroes. 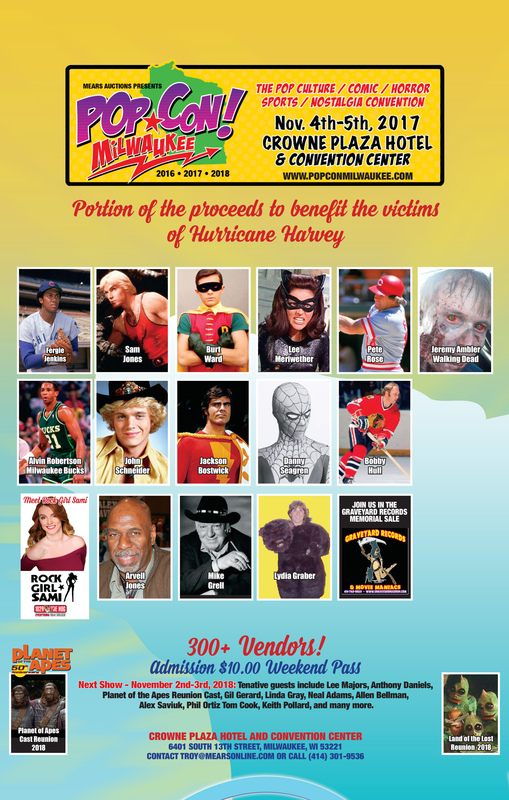 Celebrities such as Sam Jones (Flash Gordon), John Schneider (Bo Duke), Pete Rose (All-Time Hit Leader), Burt Ward (Robin), Lee Meriwether (Catwoman), Jackson Bostwick (Shazam), Danny Seagren (Spiderman), Bobby Hull (Black Hawks), Fergie Jenkins (Cubs), Baron Von Raschke (Wrestling Legend), Larry Hisle (Brewers), Jeremy Ambler (Zombie/ Walking Dead), Lydia Graber (Ewok), Jeff Butler, Mike Grell, & Arvell Jones are appearing on November 4th - 5th in Milwaukee, WI for the 2nd Annual Pop Con Milwaukee Convention. Proceeds from every ticket sale along a portion of autographs sales, prints, and photo ops will be donated to the cause. Promoter Troy R. Kinunen proclaimed, "The response from the celebrities was like a real life comic book call to action. When the people of the United States and Puerto Rico were in need, our group of celebrities were quick to lend cash, autographs, and time to the cause." Besides the diverse and impressive list of talent, over 300 quality vendors are attending which include artists, autograph dealers, breweriana, sports memorabilia, armor, comic, prints, toys, movie posters, mixed media, Victorian mourning inspired art, and more. When asked about Pop Con 2017, founder Troy R. Kinunen replied, "I am looking forward to witnessing the positive interaction of our growing fan base with the diverse personality and achievements of the celebrities in attendance and sharing the overall experience with the quality vendors which will be exhibiting their goods. Pop Con has created an intimate setting where collectors, dealers, and celebrities can meet. This is a throwback concept which embraces the "Good Ole Days" of collecting before the age of the internet." Hosted at Crowne the Plaza Hotel and Convention Center, located at 6401 South 13th Street, Milwaukee, WI 53221.The event will take place Saturday, November 4th (10:00 AM - 6:00 PM CST) and Sunday, November 5th (10:00 AM - 3:00 PM CST. Weekend admission is $10.00 Thanks, and lets have a good time at Pop Con Milwaukee.